Marjorie Orr's astonishing and sensational book reveals how major events of the last 2000 years of human history, such as wars and revolutions, terrorist outrages such as the attacks of September 11, 2001, great artistic achievements, and the rise and fall of dynasties, are all tied to the regular movements of the planets. With astroprofiles of 35 countries - from the US to India, Russia, and China - as well as those of 30 key figures who helped to shape our world, Marjorie Orr provides a startling new way of looking at history and understanding the events both of the past and of our own more recent times. Provides a startling new way of looking at history and the events of the recent past. Sets out the indisputable evidence that astrology works though in much more mysterious ways than we ever imagined. Explains how the year of your birth, and not just the month, affects your personality. The Astrological History of the World is a groundbreaking book that sensationally pinpoints the effects of the planets on the course of human development over the past 2000 years, illustrating the link between the tides of history and the movements of the planets through the heavens. "Marjorie Orr is currently the pre-eminent astrologer on the planet, and An Astrological History of the World is living proof. Not only does she enlighten us with a fascinating historical perspective on how the position and time of the stars and planets have influenced human history, she also manages to illuminate our curiosity about patterns to come with brilliantly entertaining style." "What a fascinating book. 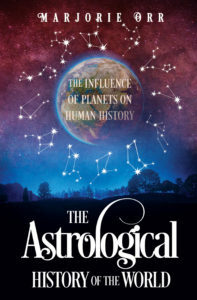 Marjorie Orr applies a sharp academic mind to the synergy between astrological phenomenon and historical fact to produce an absorbing work which puts a whole new perspective on history, and should make even the most rampant sceptic rethink their view of astrology." The birth of Islam, the collapse of the Roman Empire, and the rise and fall of Communism are all foreshadowed in the heavens. The author explains why Presidents like George W. Bush, elected under a Jupiter-Saturn conjunction, are more at risk - the very stars which marked John Lennon's extraordinary life; why India/Pakistan and Israel, 'born' under a challenging Saturn-Pluto conjunction, have a tough fate; and why Capricorn countries like the UK and Saudi Arabia are highly traditionalist. She explains the astrological links between megalomaniac dictators such as Attila the Hun, Tamerlane the Great, Hitler, Stalin, and Mao, and how an eclipse cycle has overseen tragic events in the Kennedy family history. In a staggering piece of research, astrologer Marjorie Orr has matched many hundreds of key events in the history of our world against the positions of the stars and planets to offer a thought-provoking set of explanations for the tide of human history. We should not expect astrology to have all the answers, but we need to accept it for what it is - an utterly fascinating peek through a crack into the world we live in.